Well it’s time to put a “farkle” on the R1200RT. So what is the new addition? It’s a cool little outline sticker of a map of the United States that comes with stickers of the 50 states that you fill in when you travel to them. Remember, you use the honor system here. Mine came from Two Wheel Vinyl where they sell them in multiple colors as well as reflective and non-reflective. I have to give a real nod to Nick at Two Wheel Vinyl as this is truly a home business and a labor of love! Just remember that you’re not ordering from Amazon! Nick also sends an email when he cuts your sticker and when he ships it. My sticker came packaged between a piece of folded manila folder in a handwritten envelope. Donna thought it was a card from someone! The return address label even had a dog with a Christmas present. My USA map is 6 ¼” wide by 4″ tall so make sure you have a spot to put it. He also sells North America maps that include the US and Canada. What you get in your package. Hawaii is included too but I forgot it in the picture. What you get in your package is the outline sticker of the US (or US and Canada). 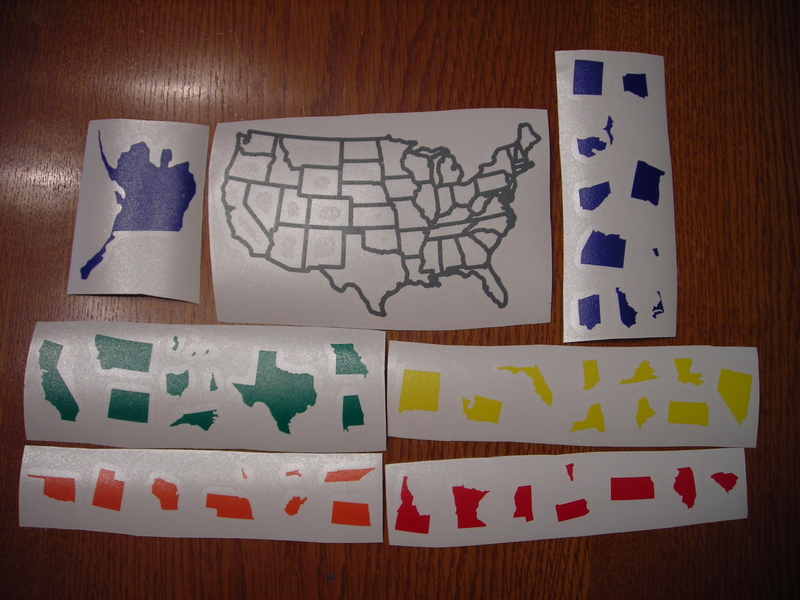 And several sheets of stickers that include the states (and provinces) in multiple colors. Nick recommends just cutting out the states you need one at a time so it’s easier to keep up with the ones you’re waiting to use. It’s a two layer sticker system in that the main stickers are also covered in a sheet that is merely tacky to allow for positioning without touching the actual sticker. Now I’m thinking I should’ve gotten one of the reflective kits, but I like the one I got. As you travel to a state you merely just cut that state out (remember that time in school when they told you knowing geography might save your life? ), put it in its spot and slowly take the clear protective cover off the top. Nick even included a sheet with the silhouettes listed by color and name to make it even easier. He even includes extra Rhode Islands because it’s so small! I only have 8 states filled in and so far there isn’t a state next to another state of the same color and I’d bet this is done by design. Since it’s been pretty cool I heated the spot where I was going to put the sticker using a hair dryer and not a heat gun. I just wanted it warm and not hot. I think the warmer surface made the sticker just a bit more pliable and helped it conform and adhere to the surface. I put mine on the back of the 49 liter top case. Why not brag about where you’ve ridden? After all, we’re not “poker run riders”. Two Wheel Vinyl also makes oval “GS” stickers in different sizes and colors. If you ride a BMW you’ll know exactly what that sticker is. Sadly they don’t have an “RT” sticker! Pointing at the images below will show you the description and clicking on it will give the full-sized image. Just use you’re browser’s back button to come back here. The map sticker on the 49 liter top case. The states we’ve ridden in so far. Yesterday I wrote the last post of 2014 and today is the first post of 2015. We started the year off with a ride. It was a long ride but it was still a ride. It was a cool overcast day with temperatures just above 50° F but it was supposed to be sunny. My Blue Knights Chapter holds and annual meeting on New Years Day and that was our destination. 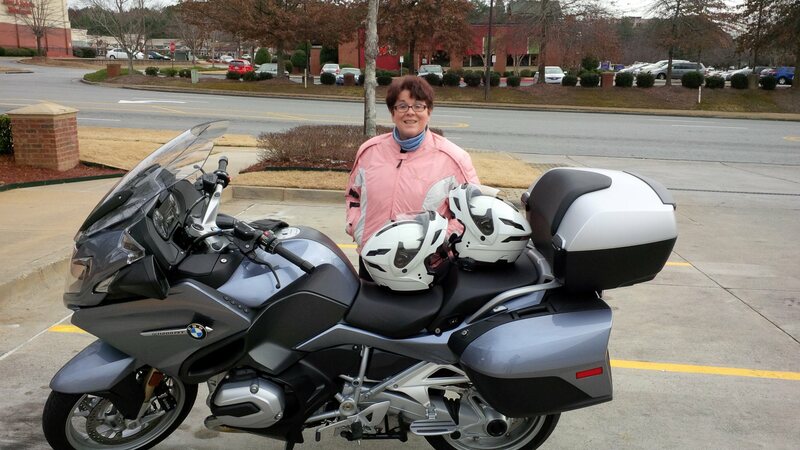 It was also Donna’s first ride with Ilium Works passenger floorboards on the R1200RT. Before we were even out of the neighborhood she was saying how much more she liked them over the foot pegs. As we rode I could tell she was moving her feet more. It’s funny but on Christmas morning I took her into the garage to show her “one more present Santa left” and it was the floorboards already on the motorcycle. She actually jumped up a little saying “Oh boy, I love them!” How many wives get excited over a motorcycle accessory even when it is for them? Out for a ride on the first day of 2015. The meeting we were headed to was a lunch meeting at an Irish Pub. I had the lunch portion of the “Bangers and Mash”. A surprise was when I was presented a plaque for being the most active member in 2014. It wasn’t something I was expecting at all! This was my first meeting as a returning Vice President of the Chapter after taking a term off. I won’t be eligible for the plaque in 2015 because I’ll be a club officer. It was my task to record the ending odometer readings of our participants in the 2014 Mileage Contest. I can say this even thought the results haven’t been officially announced but I didn’t win. But for 2015 I’ll be eligible to participate in the mileage contest even as a club officer. Until next time ride safe! Ever since Donna has been riding with me she has had a back rest or a top case to lean against for back support. For those who don’t know what a “top case” is, it’s what BMW calls a trunk. Harley Davidson calls their version a King Tour Pack or a Tour Pack (depending on the model). On our 2006 Suzuki C50T she had a nice big, swiveled back rest that she liked. On the Magic Carpet, our K1200LTE, she had that big top case with a nice, heated back rest. You know I don’t really blame her. I’d want the security of a back rest too. The R1200RT has nothing back there except a small luggage rack. BMW will sell you your choice of a few top cases that mount quite effortlessly on that luggage rack. We opted for the new style 49 liter top case that BMW began using for the 2013 model year. It took the purchasing dealer 4 weeks and a day to get it delivered and they didn’t even key it right to match the motorcycle (even though they were paid to do so). It took a trip to a second and local dealer to get the lock re-keyed in a matter of minutes. Since the top case got here a week and half ago and a week since its properly being keyed it’s been much colder than normal here, raining here or Donna had to work. Donna really wanted the top case and its back rest to ride back there. She did ride up from Daytona Beach, FL and went on an afternoon ride without the top case but really wasn’t comfortable. Yesterday it was forecast to be about 65° (F) and sunny so we went for a ride to try out the new top case. Well the temperature even got up to 70° which made for an even better day of riding. Donna enjoyed having the back rest on the top case to lean back into. She wasn’t grabbing my belt anymore. I could see in the mirrors that she was back to resting her hands on her thighs as she rode back there. To say she was much more comfortable and at ease is an understatement. But now she says the foot-pegs feel “squishy”. But then again she did have those nice big floorboards on the Magic Carpet. Even the foot-pegs on the Magic Carpet were wide and flat. The BMW 49 liter top case. If you’re a reader here you know that last month while in Florida we purchased our 2014 BMW R1200RT. We purchased it at BMW Motorcycles of Daytona. When we purchased it, the BMW Navigator V GPS was a free incentive for the purchase of the 2014 RT and we also purchased the BMW 49 liter top case (trunk) for the motorcycle and paid the extra to have the top case keyed to the motorcycle. The dealership did not have the top case in stock and had to order it. While still at the dealership someone from the parts department came up and told me that it would ship to them on October 21. They also retained one of the motorcycle’s keys so key the lock to be the same as the motorcycle. Now here’s some of the differences in dealers. They also didn’t have the GPS but said their shop in Orlando did and they would have it sent over or picked up either the next day or the following day while we were still in town. Well the GPS never showed up at the Daytona dealer. After a few calls to our salesman I found out five days later that the GPS had already “been spoken for” and they’d have to order it and send it to me. The salesman or the dealership didn’t call me to tell me, I had called them nearly a week later. A second call about the GPS and now the top case was made. The GPS had shown up that day and was sent “next day” but the top case was expected “any day now”. The GPS arrived on 10/31/14, (we bought the motorcycle on 10/16/14) the next day. Out of curiosity, I checked the UPS tracking number and found it didn’t ship “next day” on the 30th but had actually shipped UPS ground on the 29th. I know it’s a popular item. Just say it might take about 10 days to get if you don’t have it. Oh and about that top case? “Maybe on Monday.” is the answer I got. I waited a few more days to call back on the top case. On 11/05/04 my salesman and I spoke and I asked if it had actually been ordered. He said he’d check on that and “get back” with me. Five days later on 11/10/14 I called him again as he had not gotten back with me. He longer worked there. The woman on the phone asked if she could help. She remembered the sale and said either she or someone else would call me back about it. She did explain that it could be that same day (it was late in the afternoon) but would probably be the next day but shouldn’t be any later than the 12th. First thing in the morning the next day she called and said the top case was there but they needed the key. She found them in the former salesman’s desk after I told her he had told me they were there. Then on 11/14/14 the top case arrived! The key was in the lock. The key would lock and unlock the top case. But the key would not come out of the lock! No matter what I did the key would not come out. Was I supposed to ride around with a spare ingnition key in the lock? What if someone could get it out? I called the dealership. The woman who had found the case put me on hold to check what to do. Here’s the message she relayed to me, “They said to get a local dealer to fix it because it would be quicker than sending it back to them. He says it’s probably a bad lock.” That was their solution. I had paid them for the lock and paid them to key the same as the ignition key. It seems I was a valued customer to BMW Motorcycles of Daytona right up until the minute I rode off their lot. Using a few forums and the internet I was able to get the lock cylinder out. You just have to know how and have the right tools along with access to the top case. What I found was amazing. There are supposed to be 6 tumblers in the lock. My lock had 3 tumblers installed and the other spots were vacant. I needed the proper remaining tumblers to complete the job. BMW does sell a lock set with the cylinder and an assortment of tumblers. On Tuesday the 18th of November I went to my local dealer, BMW Motorcycles of Atlanta with the intent to buy a whole new lock kit if I had to. I now knew how to set the lock and re-install the cylinder. “We’ll take care of this for you.” is what I was told. “These are the only tumblers you have?” I was told “Yeah, you can do it with three but you’re really not supposed to.” He got the tumbler kit out and then told me, “Here’s why you couldn’t get the key out, this tumbler is the wrong number. 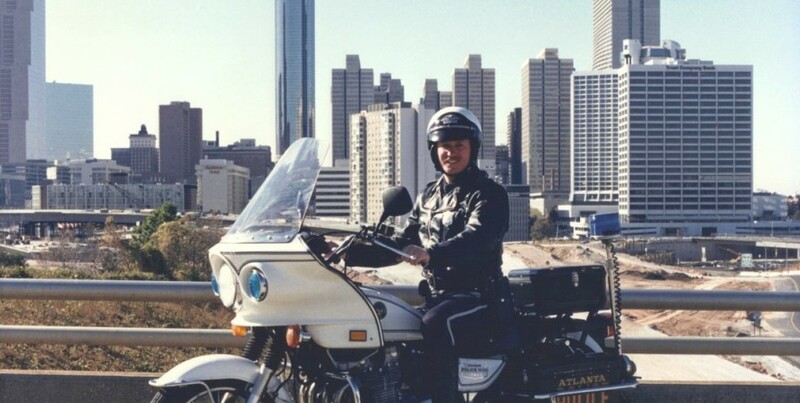 It did let you insert, lock and unlock but then wouldn’t release the key.” So in about 15 minutes or less, BMW Motorcycles of Atlanta took care of the lock. Oh and the cost? There wasn’t any. And yes I even told them I had made the purchase at another dealer. They’re a dealer who really understands what customer service is. Can you tell the difference in the dealers? Did BMW of Daytona offer to call Atlanta to see if they could take care of it for free or bill them if there was a cost? No they sure didn’t. Have they called to see it the lock issue was somehow resolved? No they sure didn’t. As it stands again would I never go into or patronize BMW of Daytona again? No I sure wouldn’t. But I’d spend the extra money to buy a part or supply from BMW of Atlanta (instead of online) because of the personal service they supply. They realize you’re a customer long after the sale and want to keep you as a customer. The owners, who are a husband and wife team are actively involved in their business. I took the R1200RT to them for its break-in service. But I’m regretting more and more not purchasing the motorcycle from them. No matter what motorcycle you purchase, research the dealer as much, if not more than the motorcycle. As someone on BMWLT.com posted; the problem was fixed by a real dealer. I’m Really Liking This Motorcycle! I took the R1200RT out for a short 126 mile ride this morning. One of the things I wanted to do was familiarize myself with the BMW Navigator V GPS system using a route I already had saved in Garmin’s BaseCamp software. There are some differences in the way the new Navigator V and the older Garmin Zumo 220 load routes and where they keep them. I left the new Navigator V GPS set so that it would give me prompts and directions through the motorcycle’s on-board audio system through the fairing speakers. We’re still waiting for our top case to be delivered so this was going to be a solo ride. Donna prefers the security of the top case and its backrest behind her plus she had to work today. I took a short and fun route that we’ve ridden a number of times and written about here. I have the route saved in BaseCamp as “Hillbilly Drive“. I take GA HWY 53 across to Dawsonville where I take a nice local road back out to GA HWY 183 going towards Amicalola Falls State Park. Before getting to the park I take GA HWY 136 over Burnt Mountain and through its curves before getting to Talking Rock, GA and heading for home. It was a cool but gorgeous day to ride! It started out right at 50º (F) and dropped to 48 going over the mountain before rising again to the mid 50’s. I was comfortable with the liner in my jacket, a long-sleeved shirt and a pair of riding pants. I even wore unlined plain leather gloves but cheated and used the heated grips. I had the SiriusXM radio tuned to the Grateful Dead station and my route in the GPS. Whenever I had an upcoming turn, the audio system automatically muted and played the instructions from the GPS. It was easier to hear the GPS than it was the music. The R1200RT fell right into the curves! I’ll admit that this was always a fun road on the K1200LT but the boxer twin R1200RT increases the fun factor exponentially. I stopped for a short break at the scenic overlook. There’s still just a little bit of color in the trees too. But after last weekend’s winter weather there was already some sand and gravel spread on a few parts of Highway 136. The boxer goes too! There were some parts of the route that I’m used to downshifting from 5th to 4th on the K1200LT to get better power. But with the R1200RT’s boxer twin you just open the throttle and it goes. I even tried out BMW’s Hill Start Assist today just to see what it’s all about. It’s like using a parking brake that automatically releases when you give the bike some throttle to start moving again. When pulling out onto the main highway up there, GA HWY 515, I finally tried out another option, BMW’s Shift Assistant Pro. Wow what an option! Shift Assistant Pro allows upshifts and downshifts without the use of the clutch. After pulling onto the highway and rolling I shifted into 3rd through 6th gears by revving and shifting and NOT using the clutch. I remember reading somewhere that Shift Assistant Pro is better suited to a more performance oriented ride. I did miss having Donna back there though. I hope that top case gets here soon. The GA HWY 136 portion of today’s ride. Looking towards Jasper, GA. There’s still just a little color left in the trees. Looking up the road on GA HWY 136 from the scenic overlook. The R1200RT takes a short break in the sunshine. The couple we’ll ride with, Sean & Christine were out-of-town and came back yesterday. What’s the first thing Donna wanted to get together and do? Well it was to go riding of course! Sean & Christine are now in the home stretch of being full-time RV’ers with a contract on their house and had already planned to look at campers and motorhomes today. We’re leaning in that direction ourselves so Donna came up with the idea for a short ride to lunch for some BBQ and then back towards home to look at campers. We met later in the morning than normal since it was a lunch ride and we headed for Dawsonville and over Burnt Mountain for lunch in Talking Rock, GA at Biguns BBQ. This is the same short lunch ride I had led some members of my Blue Knights Chapter on earlier in the week. But it does amaze me of how much cooler it is on the top of that mountain and it’s not very high. Today it was sunny and it was 8 degrees (F) cooler on the top of the mountain. We headed on to Biguns before it got too crowded and it sure did get crowded today. After lunch it was time to head down to Camping World to do some window shopping. Donna and I even found a real nice Class C motorhome that we really liked. It was to the point that we were looking at each other and scheming. We were at the point that we decided that if we could right now, we’d buy it then buy a trailer for the Magic Carpet and just hit the road. Maybe in another year or so though. Today was also the first day that I finally got Donna to wear earplugs while riding too. She finally gave in! She had tried foam earplugs in the past but didn’t like them and admittedly they did loosen up and fall look like they were going to fall out. It was time for me to replace my ETY plugs so I just ordered 2 pair this time. She really liked them when she tried them on when they got here and then she wore them all day today and found them comfortable. Do You Want The Shortest Or The Curvy Route? Earlier in the week I wrote a post about the curvy road feature in Garmin’s Basecamp software for planning routes and transferring them to your GPS. I said I’d play with it a bit and see how it went. Well, I haven’t ridden a route planned with it yet but I have let the software work its magic. 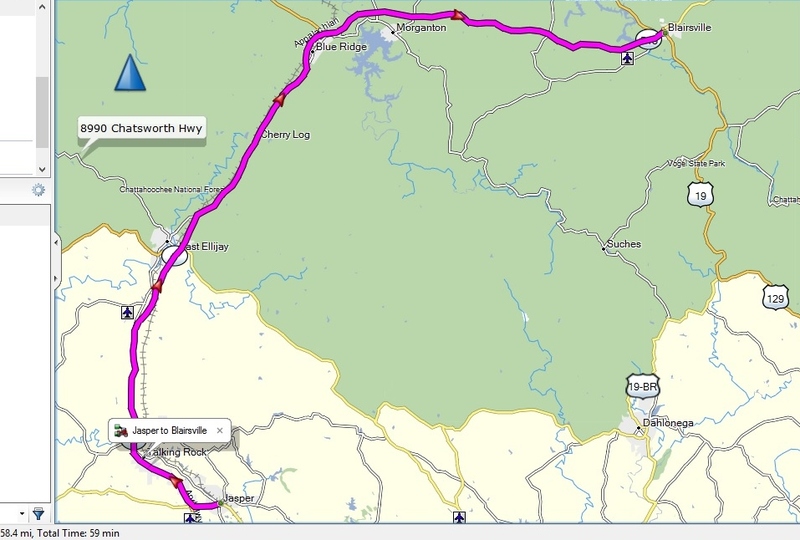 I gave it a Point A to Point B route from Jasper, GA to Blairsville, GA. I let it use the shortest route and then the curvy roads option. The shortest route came in at 58.4 miles and an estimated trip time of 59 minutes. The route is all on Georgia Highway 515/US 76 and it’s on a 4 lane highway with a grass median between the opposing lanes. But, it is a nice ride if you’re in a hurry. The curvy route was 75.8 miles and had an estimated time of 1 hour and 59 minutes to complete. The curvy route takes twice as long to complete but sure does look a lot more fun. 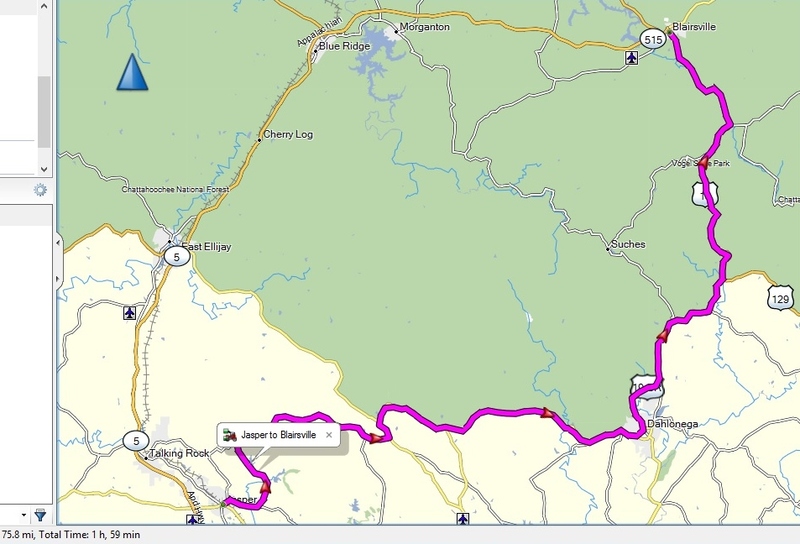 I can attest that some parts of the curvy route are even curvier than the map lets on. The shortest route selected by BaseCamp. The curvy route selected by BaseCamp. Would You Like Curves With That Route? Our Garmin Zumo 220 GPS shipped with MapSource as the routing software to accompany it. Garmin has since abandoned MapSource and began using its own software, BaseCamp, which is available for free as a download. The idea with BaseCamp (and was with MapSource) was that you could create a trip or a route on your computer, transfer it to your GPS and then load the route on your GPS and follow it. It is nice to do. By default BaseCamp checks for updates every time you load it. In BaseCamp you set options for profiles such as motorcycling, driving, hiking, etc.. With the options for each setting you can set the profile to not route you on things such as toll roads, dirt roads, avoid u-turns, highways and many more things. I noticed a feature in the motorcycle profile that I don’t know if it’s new or I’ve been missing it all this time. It’s a “curvy roads” routing feature. That’s right, curvy roads for a motorcycle! Who would’ve thought that motorcycles would like curvy roads? Well it’s an option I’m going to start playing with and see what results I get. The curvy roads options in the motorcycling profile. That’s right we went on a 228 mile ride today. No it wasn’t a trip, it was a Sunday ride. It all started the other day when I asked Donna if she wanted to go have lunch at Turner’s Corner Café at the corner of US 129 and Georgia Highway 9 today. So we got a late morning start and headed up. Here it is July in Georgia and the forecast was for a high temperature of 85°F, low humidity (rare) and mostly sunny skies. I played with the GPS software, Basecamp and created a route that would take us up using some local roads we hadn’t been on before and then transferred it to the GPS. We headed up through Canton, Ballground and Dawsonville before using Georgia Highway 400 for a short time until it ended. After we made our turn onto Georgia Highway 115 we were only supposed to be on it for a short time before making a left turn and cutting back diagonally on some nice crooked local roads. But the GPS showed it was 12 miles until our next turn. I saw what I thought was our turn go past. For some reason the GPS decided that it wanted to route us up Highway 115 to US 129 which would take us straight to Turner’s Corner Café. No big deal, we just wanted to have lunch on the river and watch the motorcycles. Once we got to lunch I brought the GPS in with us and reloaded the route and previewed it. Sure enough it showed the original route. I don’t know why the GPS didn’t use the route as planned but this is the second time this has happened. Both Basecamp and the GPS have the same maps installed. This was also my first day riding with a new pair of Do-It-Yourself custom molded earplugs. I got mine from Ear Plug Superstore. I’ve tried them before but didn’t quite get them right. This time however I took my time and didn’t second guess the instructions and they worked. They are harder to get in your ear but have quite a good seal. This may sound weird but they’re both quieter and noisier. They’re quieter in that they “muffle” sound well and I needed to turn my intercom up a bit to hear the GPS and Donna. But they’re noisier in that I think there’s more wind noise than my ETY plugs. But then that may be a good thing. I suffer from tinnitus (a ringing in your ears) and if it’s too quiet, the ringing can seem louder, will be irritating and could just make you uncomfortable. But the new self moldable plugs gave me the “white noise” effect that my hearing aids also supply and my night-time sound machine. I figured that after lunch we’d head back home as it was just over an hour and a half ride. But while eating Donna asked “Where are we riding after this?” So after lunch we backtracked down US 129 a few miles to Georgia Highway 75 Alt until we made our left (northerly) turn onto Georgia Highway 348, the Richard B. Russell Scenic Highway. This curvy stretch of mountain road only runs between Highway 75 Alt and Georgia Highway 180 and isn’t very long. There are numerous pull-offs to view the Appalachian Mountains. It’s a very fun and curvy road but there weren’t many motorcycles on it today. At the RBR’s end we made the turn on to Highway 180 for a very short distance before heading up and over Blood Mountain on US 129 and then headed for Dahlonega and home. So we had a great Sunday ride of 228 miles. Oh, and along the way today the Magic Carpet’s odometer reached and passed 82,000 miles. It’s the age-old of question of topping off the air pressure of tires conveniently at home. Yes you can always go to a gas station or convenience store to do it but everything always lists “psi cold” and the tires heat while driving or riding. I do have a Slime air compressor that works off a 12 volt cigarette lighter plug. It’s small and gets the job done but it’s seems noisy too. To do the motorcycle tires I have to get each motorcycle tire over close enough to the car to use the compressor within reach of the cord and the cigarette lighter in the car. I started looking for a compressor that I could plug into a wall outlet. I didn’t need anything with an air tank that could power a nailer or other air tool. I just needed a light duty air compressor to top off tires. I found a Kobalt 120 PSI electric air compressor at Lowe’s. It’s a handy little unit and retails for $49.98. It runs on 120 volt AC current or 12 volts DC using the cigarette lighter plug. The compressor has a digital tire gauge on it for checking tire pressures and has accessories for inflating sports equipment and air mattresses. It also has grommets on the front to hold your valve stem caps. One of the best features is that you can set the pressure you want in the tire, turn the compressor on and it will turn itself off when it reaches the pre-set pressure. No more guessing, checking, pumping and checking. The air hose and 120 volt cord wrap around the unit and the 12 volt cord is stored in the compressor. There’s also a compartment for spare valve stem caps, sports needles and air mattress/toy nozzles. The 12 volt cord is more than ample to reach all four tires on a vehicle but the 120 volt cord is only 21 inches long. I’ve checked the pressure against both an Accu-Gage dial pressure gauge and a BMW digital tire pressure gauge and it hasn’t been more than one half pound off. I think it’ll be a handy tool in the garage. Now I can leave the motorcycle right where it is and top off the pressure in the tires if needed. In the video below I let 3 pounds of air from the back tire and then set the compressor at 48 PSI. It stops when it reaches 48. Runs off of the cigarette lighter in the car or household current. All cords are retained around or in the compressor. Can be set to turn off at a pre-set pressure. 12 volt automobile cord is long enough to reach all four tires. 120 volt household cord is way too short and requires an extension cord. After 10 minutes of continuous use it should be allowed to cool for 10 minutes. No you won’t be able to completely fill and set a bead on a tire with this little gem but it’s great for everyday use in maintaining tire pressures. 2 Wheel Travelers Bob & Ruth’s motorbike travels in the Southeast and beyond. Coyote An Australian touring rider’s blog.